Welcome to WILEMANS CLASSIC SPARES. 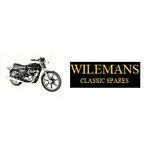 Specialists in British Motorcycles and Spares since 1938, Wilemans Motors have supplied quality spare parts by mail order for over 25 years. Our Ebay Shop now allows us to offer a selection of spares at competitive prices using our fast and reliable service.